It’s no secret that Twitter engagement has jumped from retweeting to favoriting — or what Twitter now calls “likes.” Anyone can see that in their feed. But why? 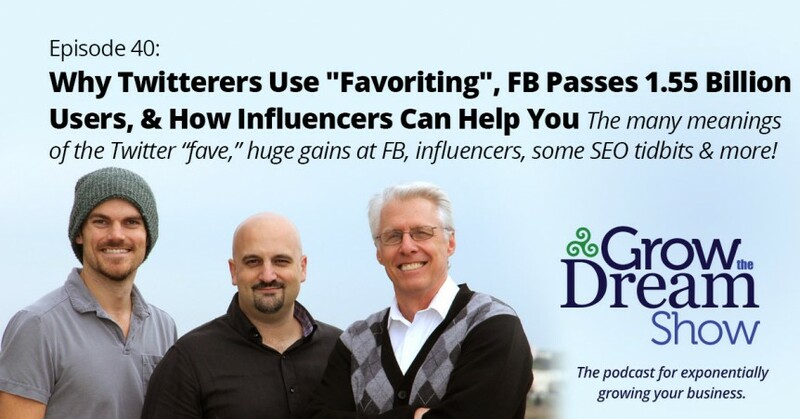 There are actually several strategies, and some silliness, behind how people are now using the “like” button, and we discover that the three Grow the Dream guys somewhat represent that diversity. Plus Facebook just keeps growing and growing and growing. How big can it go? How many people are on the planet? Plus the importance of creating relationships with influencers, using 301 redirects with the Yoast plug-in and using Schema.org markup. Formerly known as Webmaster Tools, Google Search Console is a very important dashboard which Google uses to communicate urgent warnings and other critical information about your website to you. In addition, there’s a wide variety of useful info in there which you may not know about, as well as some ways you can provide Google some information that can have a big impact on your site’s visibility. 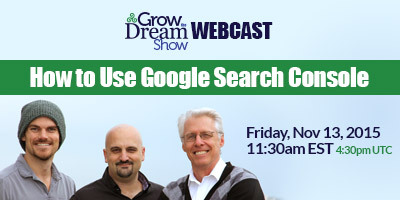 This Friday, 11/13/2015, we’ll walk you through how to use Google Search Console on our first-ever live webcast! Reserve your seat here for this live event. We’ll use a webinar platform to facilitate screen sharing, live Q&A, and more. It all gets underway on Friday at 11:30am EST / 4:30pm UTC. Check that time in your time zone here. Remember: you must RSVP to attend. If you can’t join us, we’ll make sure you get access to an on-demand replay afterward, but you must RSVP to be notified. RSVP now. Thanksgiving is coming up! (In the US, at least… you Canadians beat us to it.) Here’s the Charlie Brown Medley by The Piano Guys for your holiday listening pleasure. Facebook announces big numbers, including 1.55 billion users, $4 Billion in revenue this past quarter, and now 8 billion daily video views, which is double the number from April, 2015. We have a brief discussion about how schema.org markup works, why you should be using a current WordPress theme to handle it for you, and how this type of markup can help (or hurt!) your SEO. Speaking of great SEO plugins for WordPress, Yoast pulled a stunt recently and hid the 301 redirects box from us.